A foundational story about the development of copyright in America is the question of whether product labels could – or should – be protected by copyright. As far as I can tell this question marked the beginning of denying copyright registration on the grounds of subject matter, and I think is an important story to tell for understanding a number of current debates regarding copyrightability, and also serves as an antecedent to the modern copyright examination system. I’ve written about this story some in the past, in my 2012 article Reimagining Bleistein: Copyright for Advertisements in Historical Perspective, but it’s worth highlighting this story separately from the broader narrative in that piece, and I’ve found some additional parts to this story since I published that piece. Although the 1790 Copyright Act only prescribed a limited species of works for protection, for instance omitting music from the list of protected works, Courts would quickly hold that a musical work or even a single sheet of paper could be registered for copyright as a “book” (or after 1802, a “print”). This matches a general early tendency to be liberal in what could be registered. However, in 1848 Justice McLean, riding Circuit, held in Scoville v. Toland that a label that reads “Doctor Rodgers’ Compound Syrup of Liverwort and Tar. A safe and certain cure for consumption of the lungs, spitting of blood, coughs, colds, asthma, pain in the side, bronchitis, whooping-cough, and all pulmonary affections. The genuine is signed Andrew Rodgers” is not subject to copyright. Justice McLean reasoned that the purpose of the label was only to identify the product, and it communicated nothing beyond its association with the product – and accordingly copyright law would not protect it. In the 1850s, the copyright records show a clear upwards trend in registrations of product labels for copyright protection, and coupled with the Scoville decision, this led some to question whether product labels were protected by copyright – especially regarding patent medicines. Congress did not intend to prevent the imitations of the stamps and labels of any manufactured article, or goods, or merchandise [under copyright law]. That is a subject of such extensive interest and importance, that, if it had been the intention of Congress, to embrace it in the provisions of the law, that intention would have been distinctly and unequivocally manifested. In response to a letter from Mr. Conkling, the State Department (responsible for the administration of copyright until 1859) issued a circular stating that “inasmuch as mere labels are not comprehended within the meaning” of the copyright law, clerks were instructed to “refuse, in all cases, to record or issue a certificate for the same” under the copyright law. In 1859, copyright responsibilities were moved to the Interior Department, which delegated them to the Patent Office (although registrations themselves remained the responsibility of the clerks of the district courts). Shortly after this act was put into effect the Patent Office put out a circular to the same effect as the State Department circular a few years earlier, specifically directing the district courts not to register “stamps, labels, and other trade-marks of any manufactured articles, goods, or merchandise” because “the acts of Congress relating to copyright are designed to promote the acquisition and diffusion of knowledge, and to encourage the production and publication of works of art,” and thus labels were not “embraced within the meaning of the [copyright] acts.” Thus a label, no matter how artful, could not be registered as copyright, but might be registered as a design patent.2 It’s likely that the list of labels, trademarks, etc that the Patent Office produced in 1859 and supplemented in 1861 stemmed out of the release of this circular. In spite of these clear pronouncements, compliance with these circulars varied. In a Series of Letters from 1864-1866 (PDF, 4 MB, from the miscellaneous files of copyright records in the Rare Book Room of the Library of Congress), a successor as clerk of the District Court for the Northern District of New York complained that he was getting many requests to register labels, and that a common complaint was that the Southern District of New York had no such compunctions about issuing copyright registrations for product labels. Given that the Southern District had a much higher volume of copyright registrations that is perhaps understandable that less attention would be paid at the Southern District (there are 4,484 pages of copyright records microfilmed from the Northern District from 1820-1870, compared with 54,822 from the Southern District for the same period). Perhaps more notable is that aside from the Northern District of New York, there’s no real record of other courts refusing to register labels (that I’ve found – the copyright records of many Courts are overflowing with labels by the end of the 1860s). Nonetheless, the Copyright Office issued a Circular in response in 1866 (PDF, 1 MB, this copy from the NJ 1846-1870 Copyright Files at the Library of Congress) making clear that their views on whether labels were protected by copyright had not changed. The language the Commissioner of Patents used is a development from Justice McLean’s opinion in Scoville v. Toland 18 years earlier, and it has a whiff of the concept of aesthetic separability that was argued in Mazer v. Stein 88 years later. As all the acts of Congress related to copyrights are designed to promote the acquisition and diffusion of knowledge, and to encourage the productions and publication of works of art, it has always been held that stamps, labels, and other trade-marks of any manufactured article, goods,or merchandise are not embraced within the meaning of the acts. When any production is issued as an object of art, having value in itself, and intended for sale as such, it properly comes within the provisions of the copyright law; but when, however artistically executed, it is not produced for sale as a work of art, but is designed to be affixed in the manner of a label to a manufactured article, it then plainly falls under the act relating to patents for designs, and consequently cannot be protected by copyright. As noted, despite repeated encouragement from Washington, it does not seem that other Districts followed the lead of the Northern District of New York. As I tell in much greater detail in my article, when copyright was centralized at the Library of Congress in 1870, the Library was quickly overwhelmed with applications to register product labels for copyright, and in 1874 the Librarian convinced Congress to pass a law transferring responsibility for registering labels to the Patent Office, where they would be a sui generis form of intellectual property registered along the same rules as those for registration of copyright. The statute attempted to create this entire new form of intellectual property in one paragraph of statutory language, and hijnks predictably ensued, including a case where the Patent Office repeatedly ignored mandamus from what is now the D.C. Circuit Court of Appeals to register labels without examination. The decision of the Supreme Court in the Trade-Mark Cases in 1879 (holding the 1870 Trademark Act unconstitutional) did not stop the process of label registration, but the Supreme Court’s 1891 holding in Higgins v. Keuffel that a label for india ink was not protected by copyright did pause the system of label registrations with the Patent Office for a number of years. The label at issue in the case of Higgins v. Keuffel, along with its registration information. However, in 1893 the Comissioner of Patents ruled that labels could be registered, provided they were of sufficient originality to meet the authorship requirements of the copyright clause (which the label from Higgins did not). However, the Comissioner held that the advertisement at issue in Ex parte H.J. Heinz Co., 62 O.G. 1064 (Comm’r Patents, 1893) was of sufficient originality to qualify for registration as a label. The product label Heinz successfully registered following an appeal to the Commissioner of Patents in 1893. Somewhat surprisingly, commercial labels and advertisements would not be returned to the jurisdiction of the Copyright Office until 1940. The story – especially after 1874 – is told in greater detail in my article, but I’ve brought it up a few times lately, and it seemed to be worth highlighting. Even more than most, this post is my opinion only, and reflects views and opinions that should only be imputed to me. The gist: The 9th Circuit should reverse in ABS v. CBS, digital remasterings of sound recordings absolutely can be protected by copyright, but aren’t always and it requires factfinding, and a digital remastering does not de facto federalize a sound recording from before 1972 protected by state law. As some of you may know, I have a fairly lengthy piece on the scope of common-law copyright for sound recordings It’s available here, although it’s still a work in progress (the staff at the Cincinnati Law Review are currently doing edits, so pagination will change some). If you want an audio version, you can also hear a version of my talk on the issue from the Library of Congress. ABS and a host of other parties assert that they own the common-law copyrights in sound recordings made prior to February 15, 1972. Under the current law, such older sound recordings are not protected by federal law, but may be protected by state law protections. The preemption provisions of the copyright law contain a specific exception until 2067, so protection for all pre-1972 sound recordings will terminate then. In practice, most states tend to follow the model of indefinite protection offered by New York under the doctrine of common-law copyright (the protection given at common law to unpublished works, under the legal fiction that sound recordings that have been commercially released are nonetheless unpublished), but the modern case law regarding whether common-law copyright includes a performance right (aka a broadcast right) is surprisingly sparse. One of the things I point out in my article is that if you cast a broader net there’s plenty of caselaw from the late nineteenth century, all of which agrees on a performance right at common law, but Courts thus far haven’t embraced this argument completely. In response to this confusion the Copyright Office recommended federalizing protection for pre-1972 sound recordings, but that has not yet happened. Earlier litigation brought by Flo & Eddie of the Turtles argued that digital radio services that would be required to pay a royalty under federal law were not doing so under state law, leading to the surprising determination by the New York Court of Appeals that no performance right exists for pre-1972 sound recordings, a decision whose ramifications have yet to fully play out. However, that decision only applied to New York state in theory (how much deference other states will accord it remains unclear), so the lawsuits brought by ABS et al are going forward in a number of other states. However, ABS made a broader claim than Flo & Eddie had, claiming that all terrestrial stations (ie regular radio) had to pay a royalty for playing their sound recordings, a requirement that does not exist at federal law. CBS Radio, one of the largest station operators in the nation, was sued by ABS in the Central District of California. The issue for the Court was that on one hand, the weight of precedent was that common-law seems to require a performance right in California (indeed, the same Court had just ruled that), and there’s no real principled way to create a separate rule for terrestrial radio as opposed to satellite radio under existing doctrine.1 However, there’s currently no requirement for paying royalties for plays of sound recordings on terrestrial radio, and there are concerns of administrability and uniformity from finding a common-law performance right on a state-by-state basis. Facing long odds given the Court’s recent decision on performance rights at state law, CBS tried a clever move – they argued that they weren’t playing pre-1972 sound recordings at all, but were rather playing post-1972 sound recordings, which were protected by federal law – but had no performance rights for terrestrial radio. The argument is that because the radio station was not playing vinyl records made before 1972, but were rather playing subsequent digital transfers, the relevant sound recordings were the digital transfers and not the originals. As such, the case should be dismissed because all parties understood no cause of action existed under federal copyright law. Somewhat implausibly, this succeeded and the Court granted summary judgment (the decision is available as a PDF here). The case is currently nearly briefed before the 9th Circuit, as noted above. There are two particular mistakes in the Court’s decision that I wanted to highlight. Firstly, the Court looked at a number of sources, including the Compendium of U.S. Copyright Office Practices, Third Edition (the Copyright Office’s examining manual), and held that for every sound recording at issue (over 100), a derivative work had been created when it was remastered into a digital version.2 However, section 803.9 of that manual indicates that the following words are indicative of de minimis creativity where no sufficient authorship exists for an independent copyight: “Declicking, New format, Noise reduction, Reissue.” In addition, “the term ‘remastering’ may refer to authorship that is mechanical or too minimal to be copyrightable.” Put another way, a remastering absolutely can be independently copyrightable, but this is a fact-intensive question that cannot be easily resolved. The District Court’s failure to engage in factfinding on the issue for each an every sound recording at issue is an easy ground for reversal. However, there is a deeper problem with the District Court’s decision’s, one which moots the need for such a factfinding – even if a derivative work was created in the transfer to digital and radio stations are playing that derivative work, radio stations are still playing the underlying pre-1972 sound recording as well. The District Court ignored a core tenet of copyright law in concluding that performance of a derivative work in a pre-1972 sound recording is only performing that derivative work, and not the original as well. Having spent much of the recent year thinking about common-law copyright, I have devised an alternative argument along the lines of the CBS argument, one which I think avoids this pitfall. I’ve included it below the jump, but be warned that I don’t think it actually works (especially in California) – and I’ll explain why too. It’s more a conceptual exploration of how common-law copyright plays out differently from statutory copyright. This is something I’d like to do as a law-review style article or book chapter at some point. But that could take years and cost millions of lives. In the interim, here are the highlights. When Thorvald Solberg was named the first Register of Copyrights in 1897, he faced daunting problems, and fixing them would consume his first years in that position. The Library of Congress – including the copyright material- was moving to its new building, now the Jefferson Building, immortalized in a semi-famous photograph. Following that came the task of modernizing the business of copyright registration – although Ainsworth Spofford (Librarian of Congress 1865-1897) had effected the centralization of copyright registration, in contrast to the earlier practice of registering copyright in the local federal court, the actual record-keeping done by Spofford was no better than what was done by the District Courts, with a general ledger of copyright registrations being kept, containing a few fields of basic information and then individually signed by the Librarian.1 At the beginning of the 20th Century Solberg introduced the “XXC” classification system and system of application forms, which would be used in modified fashion until the effective date of the 1976 Act. In 1903 the Copyright Office improved the Catalog of Copyright Entries as it evolved from an obscure circular into a proper catalog, including statistical information for the first time. Also at the beginning of his tenure, Solberg effectively engineered the appointment of Herbert Putnam to be librarian, and would serve alongside him from 1899-1930 (when Solberg retired). With the Copyright Office reaching a certain operational stability, attention then turned to the question of reforming the copyright laws. It’s fairly well-known that the original 1790 Copyright Act was largely an Americanized version of the 1710 Statute of Anne. The 1831 Act was a major advance, expanding the scope of copyright (music was not technically protected by the 1790 Act, for instance, although in practice music was registered as a “book” or print”), and making many other reforms. For most of the nineteenth century the main question of American copyright law was whether to extend copyright to foreigners, a measure that did not become law until 1891. In the interim there had been an omnibus revision to all intellectual property laws in 1870 – including a revised patent code and the first instance of federal trademark law – but aside from the change of venue to the Library of Congress, the 1870 Act was not a major shift from the 1831 Act. By the early 20th century motion pictures and sound recordings were already being widely consumed, and a heavily modified copyright law from an entirely different era was clearly inadequate. Given that international copyright had withstood a number of challenges in its first decade and now felt secure, it was time for a 20th century copyright law. Beginning in his 1901 Annual Report, Solberg would annually advocate for a new copyright law. The ball began rolling in the Senate Committee on Patents, which requested that a commission be formed to study the copyright laws in January of 1905, after which the Librarian delegated to Solberg to plan a series of conferences to meet with copyright industry representatives in the Spring of 1905 to the Spring of 1906. Transcripts of these conferences were created and were much later compiled as part of the printed Legislative History of the 1909 Copyright Act, currently available on Heinonline. By this time, Solberg was also deep into a period of study of the copyright laws that would leave him the undisputed master of them. His first major work was a study of every copyright enactment in the United States up to 1900, published that same year. In February of 1905 he followed that with his study Copyright in Congress: 1789-1904, which chronicles every action regarding copyright in Congress, including failed bills and long-forgotten petitions and memorials. By the time the revision process began, Solberg had quite literally read every proposed copyright law in this Country’s history. 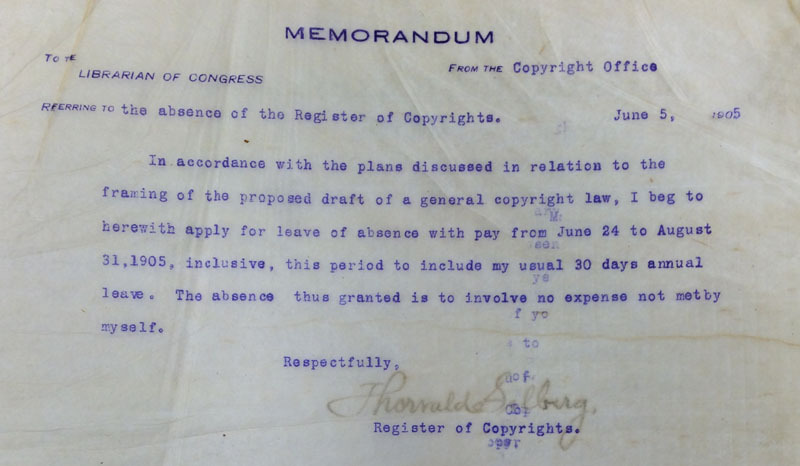 Following the Spring 1905 conference, Solberg and his small staff at the Copyright Office began the project of drafting a copyright bill out of the suggestions and comments made. By the Spring of 1906 a bill was ready, and was published along with comparisons to the current statute. The bill was introduced in May of 1906, and underwent extensive revision – with Solberg in consultation every step of the way.2 The Librarian was also involved in the discussion as the bill moved forward, but the Copyright Office had become the experts on copyright law. As mentioned, Solberg would stay in office until 1930, serving alongside the Librarian he had helped appoint all along. Even after his retirement the Copyright Office maintained its position as the governmental experts on copyright, and further existed as a largely independent agency ingrown into the Library of Congress, left alone by Librarians who had other priorities – and who also were not prepared to bring the requisite subject-matter expertise in copyright to bear. The Rare Book Room isn’t the only part of the Library of Congress with copyright records from before copyright was entrusted with the Library in 1870. As I blogged about a few weeks ago, there are many copyright records outside the Library of Congress. And of course the Rare Book Room of the Library of Congress holds the main body of these pre-1870 records. However, the Manuscript Division of the Library of Congress also has four boxes of pre-1870 copyright records. These records are held within the Library of Congress Archives, one of the collections of the Manuscript Reading Room. Those who looked closely at the guide to these records hosted by GW Law may have already noticed these records. They fall into two categories of records – letter books of copyright correspondence with the State Department, and what I’ve termed “ephemeral” copyright records, to indicate small lists of copyright registrations, usually compiled by the clerk of the court. The letter books are correspondence related to copyright with the Secretary of State, who was mostly responsible for copyright deposits until 1870. There are three continuous letter books for 1818-1824, 1824-1828, and 1828-1832. The bulk of the letters in these books are cover letters that accompanied individual deposits, although there are other documents as well. For instance, there is a letter in the 1828-1832 book from counsel for Henry Wheaton, attempting to establish the proper deposit of Wheaton’s Reports as part of the litigation that would become the Supreme Court case of Wheaton v. Peters. There is also a book that appears to be deposits with the State Department for 1853-1854, but it is on onion paper and was too fragile and voluminous to scan easily. 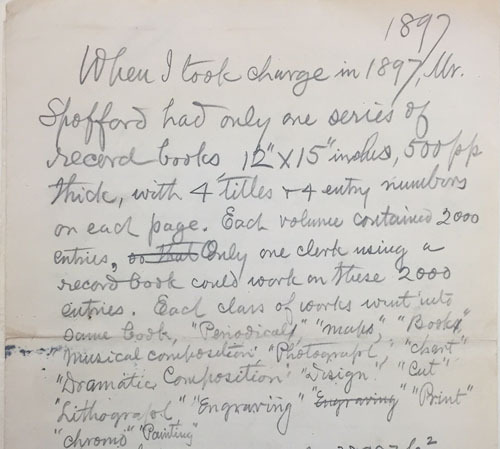 According to the Roberts survey of the copyright records, there is also a letter book of the Patent Office regarding copyright matters for 1859-1870 as well in the Rare Book Room, which would presumably be digitized along with the rest of the copyright-related material held there. In addition to these letter books there is also a single box of miscellaneous pre-1870 records in the Library of Congress archives, which I have dubbed “Ephemeral Copyright Records.” I’ve already blogged about the most interesting such document, which is a list of all registrations of labels and other nontraditional copyrighted works up to 1861. 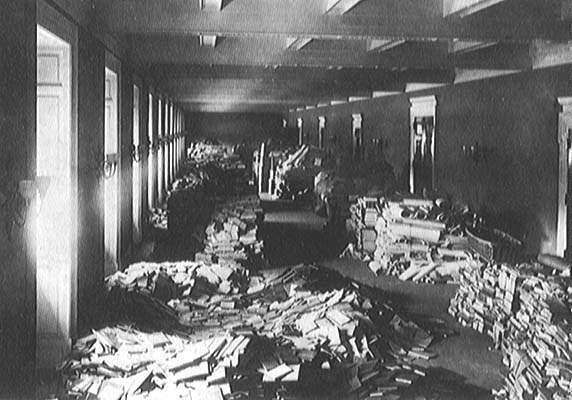 However, there are other interesting documents there as well, including a list of records created by the Library circa 1870 of documents received from the State Department, a short list of copyright deposits for which no registration could be identified, and a number of records created by individual courts. Some of these records appear to be the only extant records of the relevant registrations, while others give us a picture of literary activity in that district – one list for a six-month period in New York City in 1859-1860 shows over a thousand titles being entered (although under 400 were actually secured with a deposit). I hope these scans are helpful to researchers and lawyers; leave a comment if you have any questions.